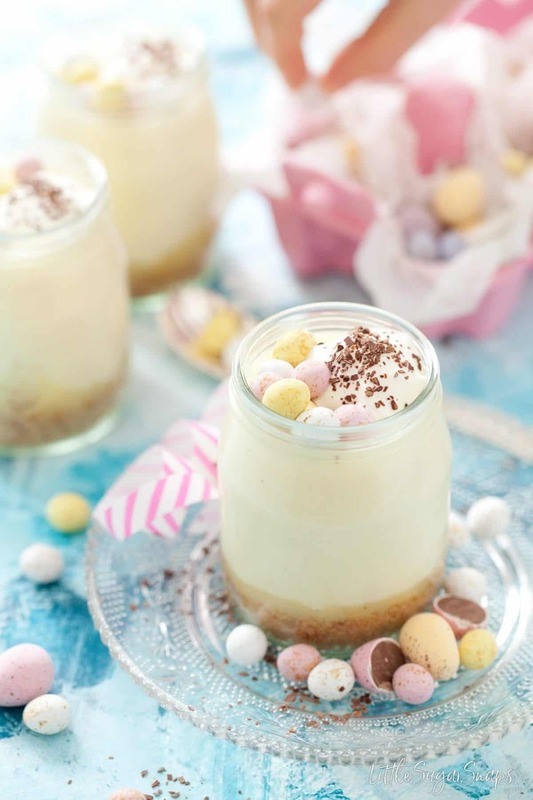 These White Chocolate Pots with layers of crumbly biscuit and lemon curd are suitable for any time of year but when topped with a few mini eggs they make the ideal Easter dessert. Inside of each pot lies a crunchy layer of buttery biscuit crumbs, a fresh & tangy layer of Vanilla Lemon Curd and a generous serving of creamy, soft, mousse-like white chocolate cream. 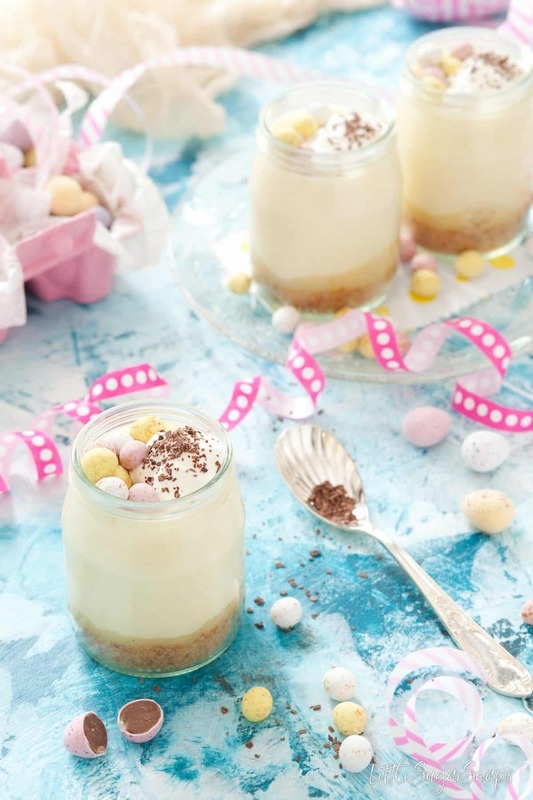 Truthfully, these dessert pots are suitable for any time of year, but when topped with a few Mini Eggs they make the ideal Easter dessert. 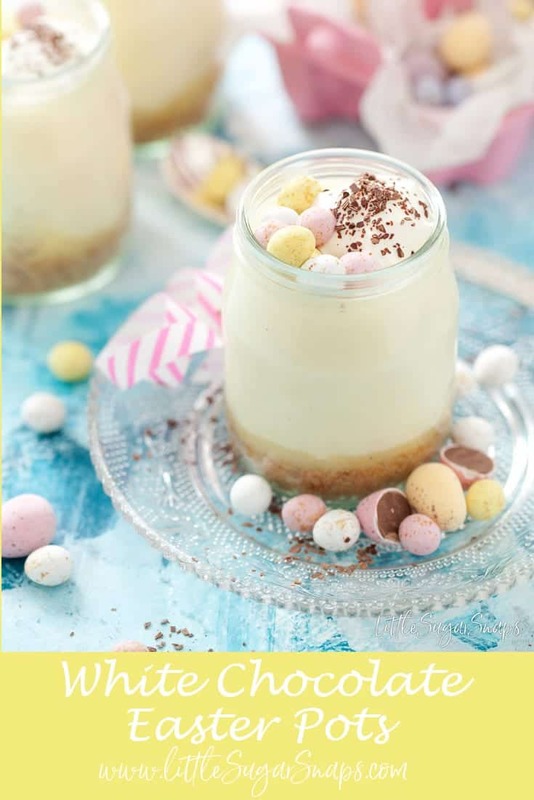 I’ve resisted my urge to call these White Chocolate Pots a mousse since, although the creamy white chocolate component is made just as a mousse is made, it is definitely softer and creamier than the average mousse. It is agreeably decadent, rather voluptuous and much more yielding than the average mousse. Granted, it’s still a little bubbly, but I wouldn’t want anybody hankering after a firmer set mousse to be disappointed. It is soft. Beautifully soft. The white chocolate cream is a lovely flavour contrast to the tangy lemon curd whilst the soft & creamy texture is the ideal partner for the buttery, crunchy biscuit base. Similarly, the crisp sugar shell surrounding those Mini eggs is a welcome foil to the creamy aspects of this dessert too. 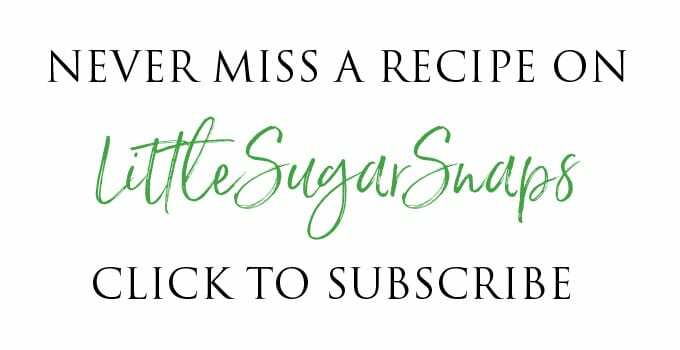 One positive of this recipe sitting in my files for 12 months is that over the course of the year I had time to monkey around with my base recipe. 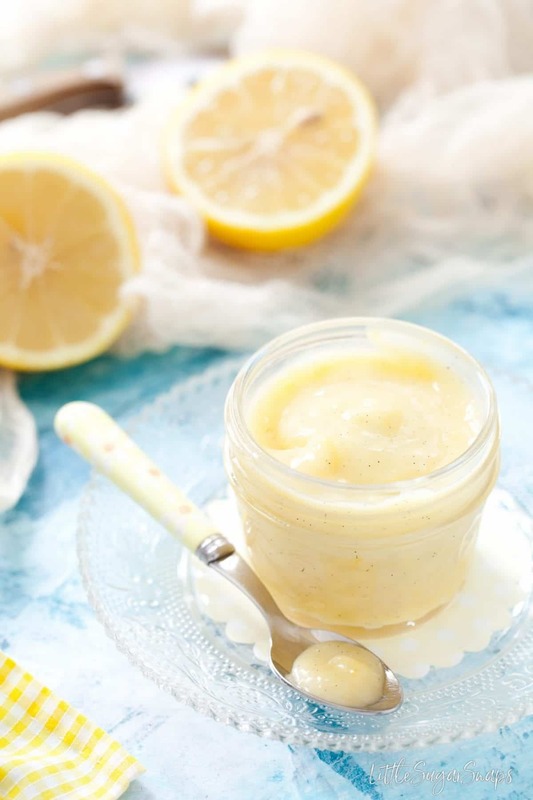 In my initial recipe, I used regular lemon curd, but with time on my hands to play around, I got swayed by the notion of tempering that bright, zesty lemon hit with creamy vanilla. It ties in with the white chocolate wonderfully well. And, since I’ve yet to see vanilla lemon curd available at the supermarket, my idea gave me the push I needed to get on and make my own curd. 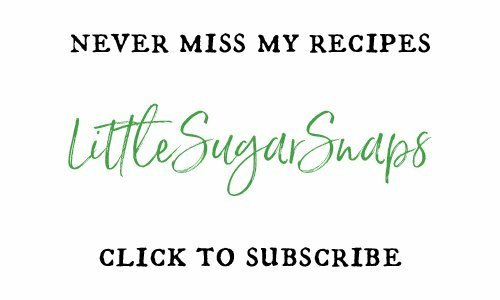 Click through for the recipe for my Vanilla Lemon Curd – it’s small batch and ready in 15 minutes. 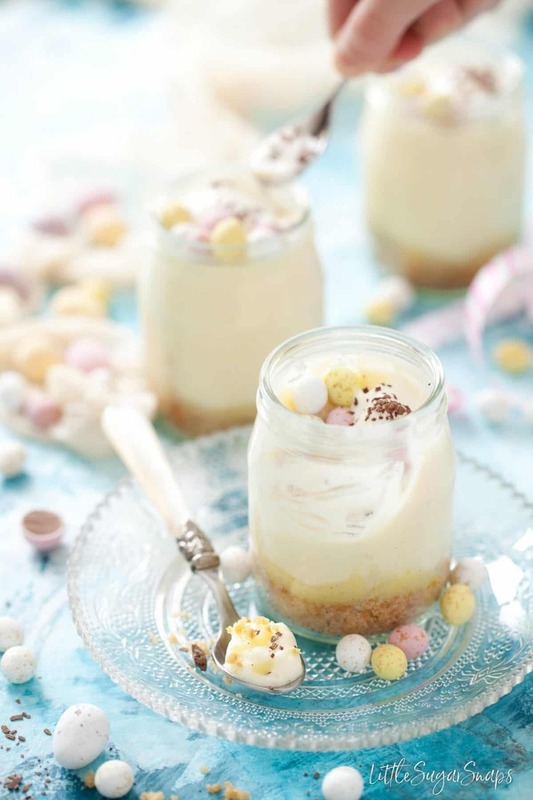 These White Chocolate Pots are quick and easy to make and require no baking. They can be made in advance and topped with decorations of your choice just before serving, whatever the occasion. But in my opinion, Easter definitely calls for Mini Eggs. Thanks! So cute..not sure what one mommy would say re the egg whites..I may do everything..but a different mousse..I already have your curd!SOOOO cute! Ah, yes Monique, they do contain raw egg white. Let me see your creation – I know it will be beautiful. 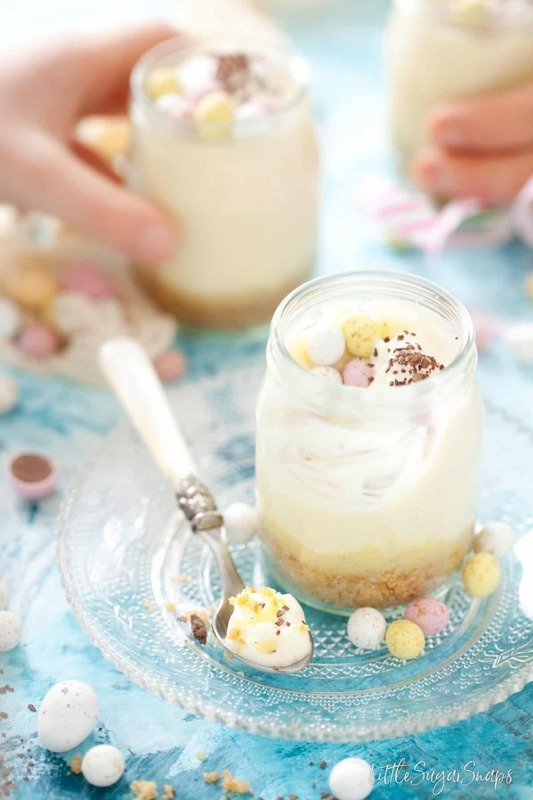 These delicious desserts will be on our Easter brunch table this year! 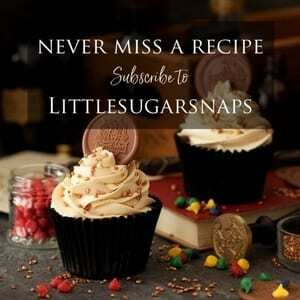 The white chocolate and lemon flavors taste perfect together – such a winning recipe! Thankyou Joanie – I hope you enjoy them as much as my family do. 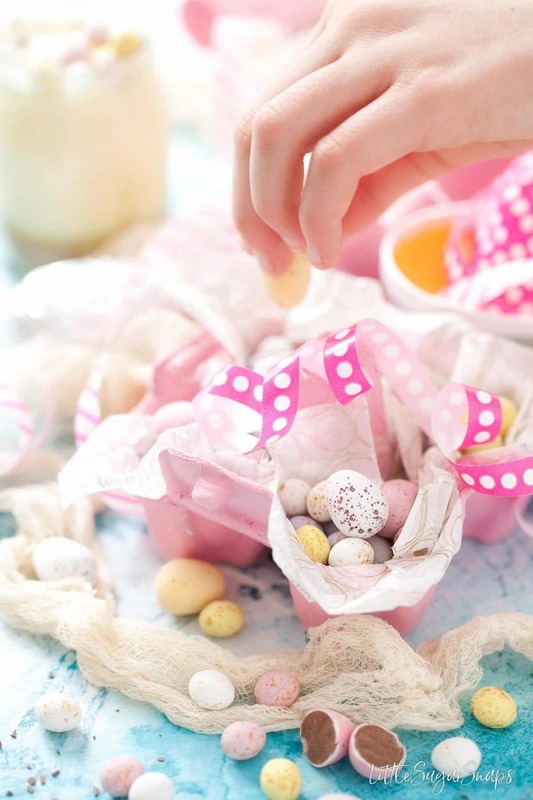 OK, I’m pinning these and putting them on my Easter menu (even though it was already planned!). 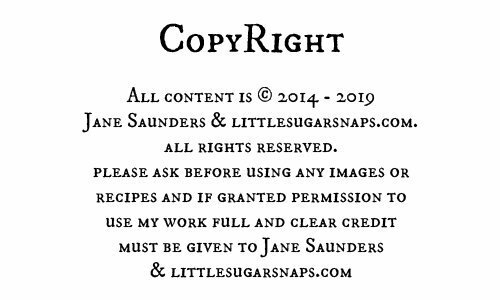 These sound so delicious and your photos are gorgeous! Thanks so much Sues – I hope you enjoy them. Thanks Jo. The pressure is one for your next visit – any special requests?